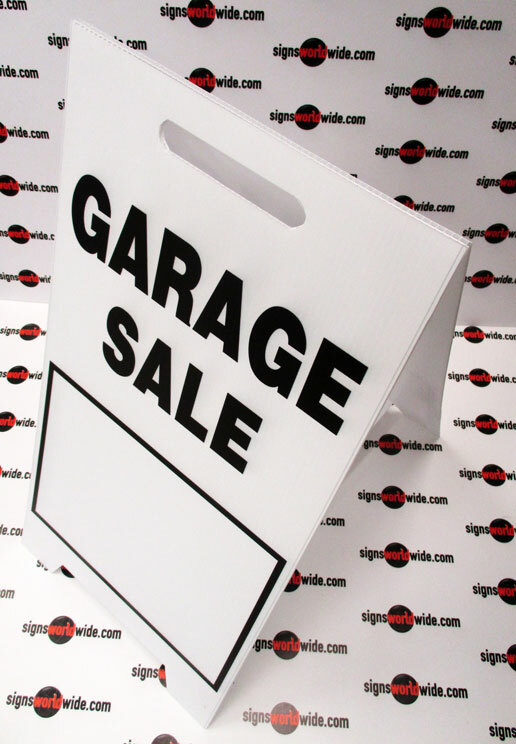 A-Frame signs, also referred to as sandwich boards, are a great way to get the attention of sidewalk traffic. 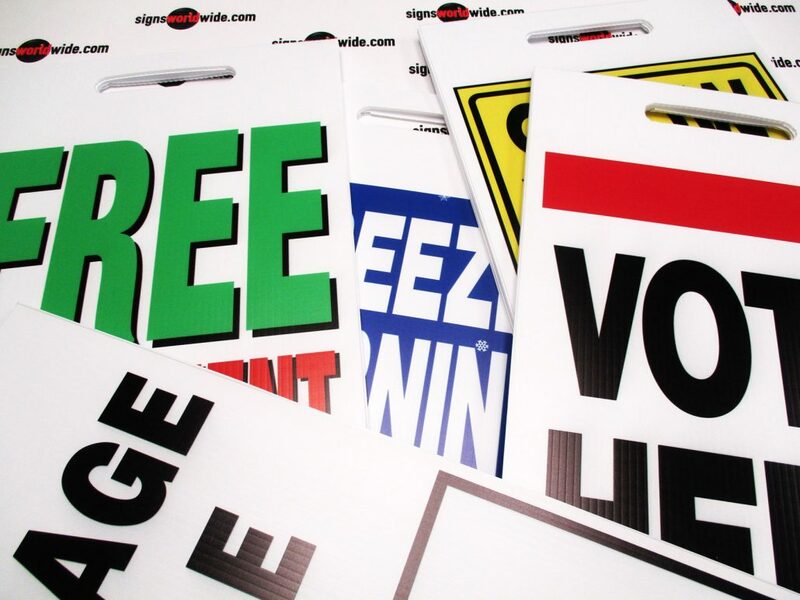 These free-standing signs can be placed on a sidewalk or in a grassy area to display important messages such as business specials, directional arrows, safety warnings or any other point-of-purchase use you can think of. One limitation of these free-standing signs has been cost. Because of their flexibility, A-Frame signs tend to be expensive and some short-term events do not warrant the cost of an expensive sandwich sign. Many of them are heavy and expensive to ship. Luckily, at Signs World Wide we offer an inexpensive A-Frame solution. 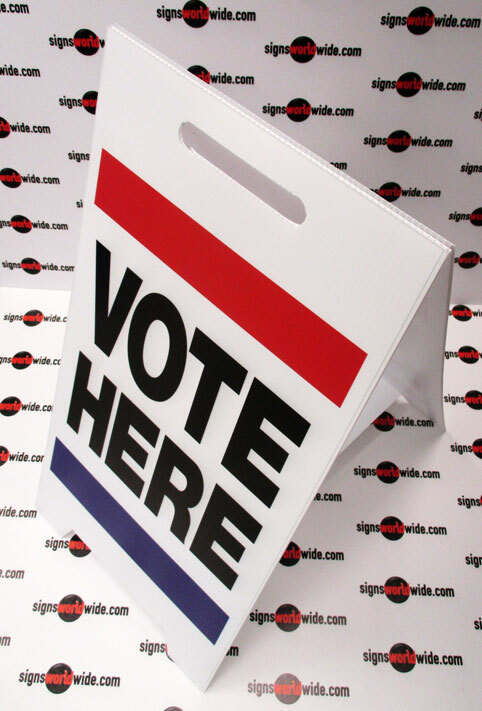 Made from lightweight 4mm fluted plastic product commonly used for yard signs, our coroplast A-Frame signs offer great temporary message display at a low cost. We offer many stock 30”h x 15”w items along with the ability to customize them according to your particular need. They are lightweight, portable, collapsible and can be assembled without any hardware or tools. If your area is particularly windy, the signs can be ballasted with weight in the middle or if they are being placed in a grassy area, you can use spikes to help keep them in place. The graphics are printed directly onto the coroplast surface using the latest UV printing technology for a smooth durable sign product. If your use requires something more substantial, Signs World Wide also offers a heavy duty A-Frame product that can provide many years of service. 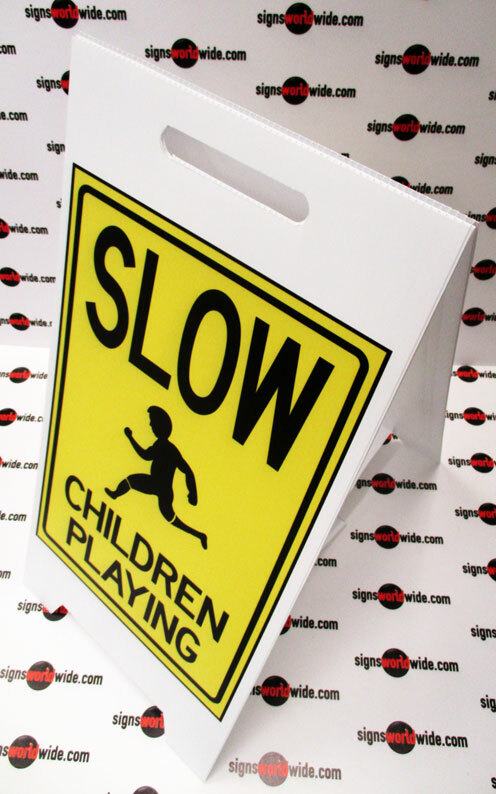 Our heavy duty A-Frame product is made from a hollow molded plastic that can be filled with sand if the sign is to be placed in a windy area. Like the inexpensive coroplast A-Frame sign, our heavy duty A-Frame can also be customized according to your needs. Just contact a Signs World Wide representative to have one designed for you. All of our signs are proudly fabricated in the United States of America.